Received May 31, 2018; Revised June 20, 2018; Accepted June 23, 2018. Ipsilateral fractures of proximal femur with shaft and condylar region are very rare. Current concept of management is based on fixation of each fracture as independent entity using separate fixation modalities for proximal and distal parts of femur. However, we considered that antegrade femoral nailing with cephalomedullary screw fixation is a good option for ipsilateral multi-level femoral fractures. Here, we present an experience of satisfactory treatment for ipsilateral femoral neck fracture, subtrochanteric fracture, comminuted shaft fracture with supracondylar fracture following road traffic accident. Ipsilateral femoral shaft with proximal femoral fracture is not common. Various literatures have demonstrated association of femoral neck fracture in about 2.5–6% to 9% cases of femoral shaft fracture [1,2]. Fracture of proximal femur, femur shaft, and distal femur has even rare incidence rate. This injury is a result of high velocity trauma usually results from road traffic accident or fall from height and seen mostly in young age patients . Various authors have demonstrated this rare injury in their literature and managed using different principles and methods of fixation [4,5]. In previous literature these cases were managed using different modalities for proximal and distal components of the fracture. The femoral neck fracture was managed separately and shaft and distal femur separately or distal fracture was managed separately while shaft and neck fracture were treated separately. Variable success rate had been achieved us ing this principle for fixation. Antegrade Intramedullary nail fixation using cephalomedullary fixation for Ipsilateral shaft and neck fracture has been described in previous literature. Using single intramedullary nail for fixation of these segmental fractures is associated with preserved biology of fracture, decreasing the chances of delayed union or non-union for shaft fracture but variable success rate for neck fracture has been noted because of inadequate mechanism for healing and vertically oriented neck fracture [6,7]. However, most literature has emphasised on anatomical reduction of femoral neck fracture and has been given priority for fixation because of increased risk of non-union and osteonecrosis of femoral head [8–10]. Treatment of supracondylar fracture of femur with antegrade intramedullary nailing is also challenging. Inadequate angular and axial stability of supracondylar fragment with antegrade intramedullary nailing can increase chances of fixation failure [11,12]. We present a case who sustained ipsilateral neck femur with subtrochanteric fracture with comminuted shaft fracture with supracondylar femur treated using single antegrade intramedullary nail. The patient was 51 years old male without any significant medical history. Patient had history of road traffic accident as he was driving car. He was developed multi-level closed fracture of left whole femur. Fractures involved ipsilateral neck fracture (Pauwel type III) with subtrochanteric fracture (AO/OTA 31-B) with comminuted shaft femur (AO/OTA 32-B2) and extra articular supracondylar femur (AO/OTA 33-A2). Patient also had closed fracture of tibia pilon in same limb that is not discussed here in this article (Fig. 1). On arrival primary resuscitative measures were done by emergency trauma team and patient was confirmed of not having any life threating injuries. Patient was admitted under orthopaedic trauma team, preoperative radiographs and computer tomography (CT) scan of injured limb was performed. After confirmation of normal preoperative assessment by anaesthesiologist patient was taken for femur fracture fixation on day of admission within 12 hours of injury. The patient was given supine position on traction table. After preliminary traction and gentle reduction, we found that lower extremity alignment was acceptable, but neck fracture was not in anatomical reduction. Entire procedure was accessed intraoperative using C-arm images. Open reduction of the femoral neck fracture was planned intraoperative using Smith-Peterson approach to anterior aspect of hip joint. Open reduction of the neck fracture was done by manipulation using ball tip pusher and maintained with pointed reduction clamp and temporarily fixed using Kirschner wire. Position of Kirschner wire was directed from anteriorly to the neck for appropriate placement of intramedullary nail. 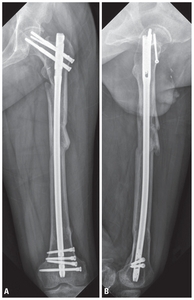 Reduction of subtrochanteric fracture was also done using same incision with pointed reduction clamp. Fracture of shaft was reduced using percutaneous placement of pointed reduction clamp through small anterior incision at fracture site. Entry for proximal antegrade femoral nailing was started from pyriform fossa, entry point was enlarged with entry reamer. After that, entry guide pin was replaced by ball tip guide wire. Guide wire was advanced under C-arm guidance till supracondylar fragment. Supracondylar fragment was found tilted with apex anterior angulation that was tried to correct by elevating the shaft fragment to negotiate the guide wire from outside. The ball tip guide wire advanced till point just distal to inferior pole of patella in anteroposterior view and centre in lateral view (Fig. 2). Intramedullary canal was reamed using cannulated flexible reamer. Intramedullary nail was inserted over guide wire and advanced in canal till supracondylar fracture reached. Apex anterior angulation was corrected with percutaneous placement of Hohmann retractor acted as a joy stick which introduced through a small stab incision anteriorly. After correction of angulation, the nail was passed over guide wire. Two guide pins for placement of cephalomedullary screw was inserted, its position was confirmed under C-arm guidance and replaced by 6 mm cephalomedullary screws. Distal fragment locking was done using 4 angular stable locking systems (ASLS®, Synthes, Oberdorf, Switzerland) from lateral to medial using free hand technique. One more guide pin was inserted to neck outside the nail anteriorly and was replaced by 6 mm cannulated cancellous screw (Fig. 3). Wound of open reduction of neck was sutured over negative suction drain, rest wounds were closed and sterile dressing was applied. Patient was mobilized using passive knee and hip range of motion (ROM) on the day after the surgery. Active knee joint rehabilitation was initiated 3 days after the surgery as the pain tolerated. Early postoperative recovery and wound management was uneventful. Patient was advised to walk non-weight bearing using crutches for 6 weeks. Patient was reviewed in follow up at 3 weeks, 6 weeks, 3 months, 4 months and at 6 months in out-patient clinics. Patient was allow to walk with partial weight bearing at 6 weeks after surgery and full weight bearing using crutches at 12 weeks after surgery. Complete radiological union was confirmed in postoperative radiographs at 8 months (Fig. 4). Combination of ipsilateral shaft femur and neck femur fracture is rare and attributed to very high velocity of injury in young individual. Becher  first published this injury in 1951. Since then management of this complex fracture is a matter of debate among trauma surgeons. Though over all prognosis of neck fracture with nonunion and avascular necrosis was found better than fracture of isolated neck femur fracture, complications involving shaft fracture was as serious as those for neck fractures . So, management of both components require equal attention. Involvement of ipsilateral neck, shaft and distal femur further complicate the scenario. In literature only few cases have been found with this very complex fracture pattern. In the study of Käch , they described this pattern of injury with basicervical neck fracture with segmental shaft femur fracture and distal femur fracture. Fracture was managed with separate implants for neck, shaft and distal femur fracture. Barei et al. described non-contiguous fracture of femoral neck, shaft and distal femur fracture in seven patients. This was the largest series of this complex fracture published in literature. They managed all seven cases using separate implant for fixation in proximal and distal fracture fragment. Cannulated screws, dynamic hip screw or reconstruction nail were used for fixation of neck fracture while either retrograde or antegrade nail was used for fixation of shaft fractures. Plate was used for fixation of shaft in one case. Articular distal fragment fixation was done either using screw or plate after anatomical reduction. Though varus mal alignment of neck fracture was noted in one case, nonunion and avascular necrosis was not noted in any case . In the study of Lambiris et al. , they presented a newer classification for complex femoral shaft fracture. He described three cases with ipsilateral neck, shaft and distal femur fracture. In their study, distal femur fracture was managed with free cancellous screws and femur shaft fracture with intramedullary nail and neck femur was with free cancellous screws in given order. Douša et al. described long term outcome of five cases of ipsilateral fracture of femoral neck, shaft and distal end. All patients were treated with separate implants using either dynamic hip screw with retrograde intramedullary nail or dynamic hip screw with 95 degrees angle blade plate or long proximal femoral nail with 6.5 mm screws for condylar fracture . In our case, patient had injured due to high velocity road traffic accident, which is similar to the mechanism found in most literature [1,7,17]. Our patient had ipsilateral neck fracture with subtrochanteric fracture with comminuted shaft femur and extra articular supracondylar femur. To the best of our knowledge, no study described involvement of femoral neck, subtrochanter, comminuted shaft and supracondylar fracture together in one femur. In our case neck fracture was vertical fracture pattern as type III according Pauwel classification. Pauwel type III fractures are considered to be the most unstable pattern of femoral neck fractures. They are axially and rotationally unstable and have maximum chances to failure with shearing forces. Hence anatomical reduction and stable fixation of Pauwel type III fracture is recommended in literature . Fixation of femoral neck fracture was done using two cephalomedullary screws through nail and one screw inserted anterior to the nail. In the previous study, they had used of dynamic hip screw, cannulated cancellous screw or reconstruction nail for fixation proximal fractures [4,5,16]. We started our procedure with open reduction and internal fixation of femoral neck fracture using anterior approach and fixation was given priority over others. Barei et al. had also mentioned that open reduction and internal fixation of the displaced femoral neck fracture should be the primary focus. However, Lambiris et al. argued that proximal femoral fracture was fixed at the end after fixation of distal femur and shaft fracture. In study of Douša et al. , distal femoral fracture was fixed first in type C distal femoral fracture and followed by shaft and proximal fragment. Fracture fixation in our case was done using single reconstruction type of antegrade nail which taking entry from pyriform fossa. Significance of entry of antegrade nail from pyriform fossa has already been proven in subtrochanteric fractures . Subtrochanteric fracture was reduced through same anterior approach used for neck fracture using pointed reduction clamp. Femoral shaft and supracondylar fracture were reduced using pointed reduction clamp and Hohmann retractor respectively using single stab incision just anterior to fracture site. Usage of this minimally invasive techniques helps to achieve better anatomical alignment without damage to the biology around fracture site . Fixation of distal fragment was done with 4 angle stable locking system from lateral to medial side using free hand technique. Angular stable locking system provides higher torsional stiffness and less motion under torsional loading. With respect to the wider intramedullary canal and thinner cortex at distal femoral region angular stable locking system provide better angular and axial stability against conventional locking screws . Distal shaft fractures treated with intramedullary nail were associated with mal-reduction and mal-union. These complications are attributed to widening of canal and smaller distal fragment, that doesn’t provide adequate support to conventional screw. Because of this inadequate support there is an increased interfragmentary movement at fracture site which leads to loss of reduction and often difficulty in achieving union . Authors believe that antegrade intramedullary nailing with cephalomedullary fixation of neck fracture and angular stable locking system for distal fragment fixation provided adequate stability for bone healing in this complex case. However, it’s difficult to generalised use of antegrade intramedullary nailing with cephalomedullary fixation of neck and distal locking using angular stable locking system for such a complex fracture of femur involving neck, sub trochanter, shaft, and supracondylar fracture by success of just one case. Further studies with larger sample size are required to prove the effectiveness of this construct for such a complex fracture pattern. Fig. 1. (A) Anteroposterior view, (B) lateral view and (C) oblique view demonstrate ipsilateral femoral neck, subtrochanteric, comminuted femoral shaft, and supracondylar fracture of left femur. Fig. 2. (A) Unreduced fracture femoral neck femur. 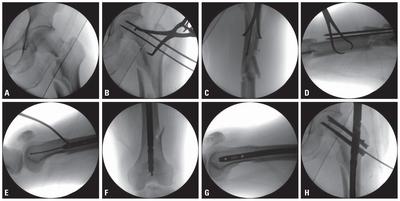 (B) Reduction of femoral neck using pointed reduction clamp and percutaneous Kirschner wire. (C) Reduction of subtrochanteric fracture using pointed reduction clamp. (D) Reduction of shaft fragment using pointed reduction clamp. (E) Reduction of supracondylar fragment using percutaneous Hohmann retractor. (F, G) Final nail Position just distal to distal tip of patella in AP and central in lateral. (H) Fixation of cannulated cancellous screw out of the nail after fixation of cephalomedullary screws. AP: anteroposterior. Fig. 3. (A) Radiograph shows anatomical reduction of neck fragment. (B) At anteroposterior, lateral and oblique images of the femur, radiographs demonstrate anatomical reduction of neck and anatomical alignment of shaft. (C) Postoperative 3D CT scan demonstrates anatomical reduction of neck. (D) Postoperative CT images demonstrates anatomical reduction of neck. CT: computer tomography. Fig. 4. Follow-up (A) anteroposterior view and (B) lateral view of radiographs at the postoperative 1 year 10 months after index surgery demonstrates complete bony healing. Ostrum, RF, Tornetta, P, Watson, JT, Christiano, A, and Vafek, E (2014). Ipsilateral proximal femur and shaft fractures treated with hip screws and a reamed retrograde intramedullary nail. Clin Orthop Relat Res. 472, 2751-8. Tsarouhas, A, Hantes, ME, Karachalios, T, Bargiotas, K, and Malizos, KN (2011). Reconstruction nailing for ipsilateral femoral neck and shaft fractures. Strategies Trauma Limb Reconstr. 6, 69-75. Gadegone, W, Lokhande, V, Salphale, Y, and Ramteke, A (2013). Long proximal femoral nail in ipsilateral fractures proximal femur and shaft of femur. Indian J Orthop. 47, 272-7. Douša, P, Bartoníček, J, Luňáček, L, Pavelka, T, and Kušíková, E (2011). Ipsilateral fractures of the femoral neck, shaft and distal end: longterm outcome of five cases. Int Orthop. 35, 1083-8. Barei, DP, Schildhauer, TA, and Nork, SE (2003). Noncontiguous fractures of the femoral neck, femoral shaft, and distal femur. J Trauma. 55, 80-6. Hak, DJ, Mauffrey, C, Hake, M, Hammerberg, EM, and Stahel, PF (2015). 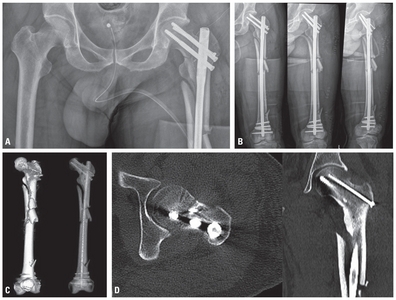 Ipsilateral femoral neck and shaft fractures: current diagnostic and treatment strategies. Orthopedics. 38, 247-51. Kumar, CY (2014). 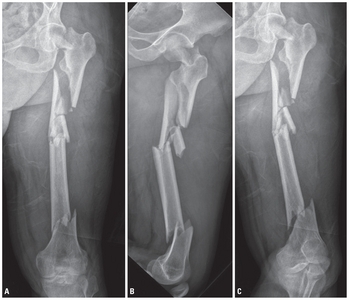 Long proximal femoral nail in ipsilateral fractures of proximal femur and shaft of femur. Indian J Orthop. 48, 439-40. Hung, SH, Hsu, CY, Hsu, SF, Huang, PJ, Cheng, YM, and Chang, JK (2004). Surgical treatment for ipsilateral fractures of the hip and femoral shaft. Injury. 35, 165-9. Bucholz, RW, and Rathjen, K (1985). Concomitant ipsilateral fractures of the hip and femur treated with interlocking nails. Orthopedics. 8, 1402-6. Koldenhoven, GA, Burke, JS, and Pierron, R (1997). Ipsilateral femoral neck and shaft fractures. South Med J. 90, 288-93. Ingman, AM (2002). Retrograde intramedullary nailing of supracondylar femoral fractures: design and development of a new implant. Injury. 33, 707-12. Bong, MR, Kummer, FJ, Koval, KJ, and Egol, KA (2007). Intramedullary nailing of the lower extremity: biomechanics and biology. J Am Acad Orthop Surg. 15, 97-106. Becher, H (1951). Nailing of femur neck fracture nailing of femur neck fracture with a concomitant fracture of femur head. Zentralbl Chir. 76, 1609-12. Bennett, FS, Zinar, DM, and Kilgus, DJ (1993). Ipsilateral hip and femoral shaft fractures. Clin Orthop Relat Res, 168-77. Käch, K (1993). Combined fractures of the femoral neck with femoral shaft fractures. Helv Chir Acta. 59, 985-92. Lambiris, E, Giannikas, D, Galanopoulos, G, Tyllianakis, M, and Megas, P (2003). A new classification and treatment protocol for combined fractures of the femoral shaft with the proximal or distal femur with closed locked intramedullary nailing: clinical experience of 63 fractures. Orthopedics. 26, 305-8. Gao, K, Gao, W, Li, F, Tao, J, Huang, J, and Li, H (2011). Treatment of ipsilateral concomitant fractures of proximal extra capsular and distal femur. Injury. 42, 675-81. Enocson, A, and Lapidus, LJ (2012). The vertical hip fracture - a treatment challenge. A cohort study with an up to 9 year follow-up of 137 consecutive hips treated with sliding hip screw and antirotation screw. BMC Musculoskelet Disord. 13, 171. Kempf, I, Grosse, A, and Beck, G (1985). Closed locked intramedullary nailing. Its application to comminuted fractures of the femur. J Bone Joint Surg Am. 67, 709-20. Rhorer, AS (2009). Percutaneous/minimally invasive techniques in treatment of femoral shaft fractures with an intramedullary nail. J Orthop Trauma. 23, S2-5. Hoffmann, S, Gerber, C, von Oldenburg, G, Kessler, M, Stephan, D, and Augat, P (2015). Effect of angular stability and other locking parameters on the mechanical performance of intramedullary nails. Biomed Tech (Berl). 60, 157-64.